Aquaponics is the marriage of Aquaculture (farming fish) and hydroponics (growing plants in a soil-less medium). While both of these systems are efficient they have some major drawbacks. By taking the best of each type of farming, aquaponics solves the problems associated of each. Aquaculture is simply fish farming. By keeping fish in overstocked tanks we are able to efficiently produce a fish crop without the use of boats, nets or fishermen. Traditional fish farms have been known to be environmental disasters. Fish are kept in small tanks with their water continually recirculated. Their effluent quickly builds to toxic levels. To solve this up to 15% of the water is cycled out daily, often into streams and ponds, causing toxic shock to the environments. Aquaponics addresses this waste issue and turns it into an advantage. Hydroponic systems use large quantities of water and man made chemicals to feed plants in a soil-less grow media such as gravel, lava rock, or expanded clay. If kept in a greenhouse they can produce food year-round. They are extremely energy efficient and relatively simple to care for. The largest drawback is that they rely on chemical fertilizers and require constant monitoring to maintain nutrient levels. Aquaponics removes the need for external fertilizers. 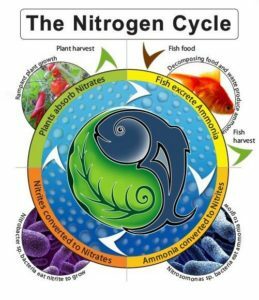 Aquaponics does this all cleanly and simply through the use of the nitrogen cycle. 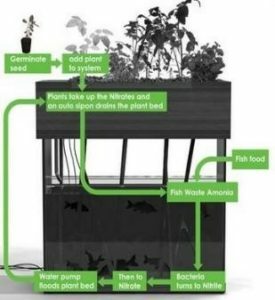 This simple system comprises of a fish tank, a water pump, a grow bed and some plumbing. The fish happily spend their days swimming in a circulated tank of water. As they are fed and excrete, the water is pumped from the tank. These bacteria take the ammonia from the fish waste and converts it into nitrites. These nitrites are not food for our plants yet. Next, a different bacterium converts these nitrites into nitrates; which are readily absorbed into the plants, providing food. As the grow bed floods the plant’s roots are temporarily submerged, providing them water and nutrients. As the bed drains the roots are provided air so as not to rot. Once the water has been cleaned by the bacteria and plants it drains back into the fish tank. The water is cleaned and the fish are happy. By combining these two systems we help to close the ecological loop of both systems. The fish waste that was a problem becomes food for our plants. Our plants that used to require fertilizer input now are fed from the waste from our fish. The only major input into this system is fish food. Water is conserved and there is no waste released into the environment. A small aquaponics system can provide both a fish crop and a plant crop. Many other problems are also solved such as no weeding needed, no bugs or pest to disturb your crop, grow beds are typically raised as to be easier to harvest and plant, and you will never forget to water your plants again!